Study 2: Stimulation of collagen | EVENSWISS®: a leader of signalling cosmetics. New age in anti-aging beauty care! 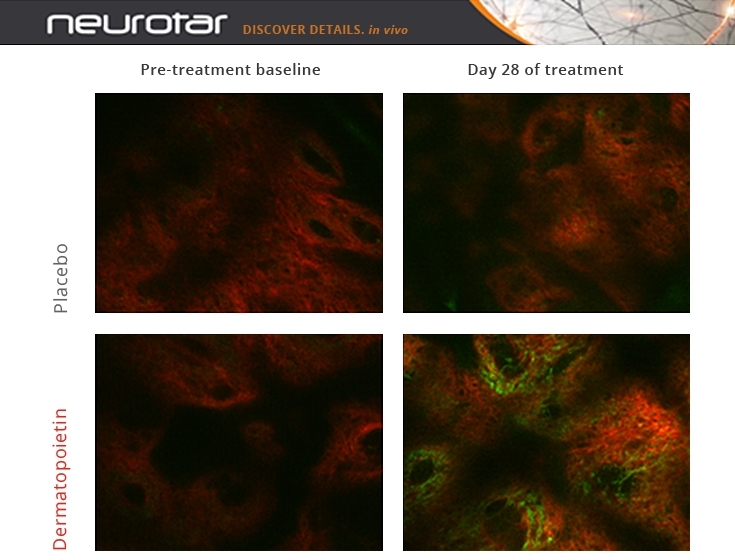 The study was performed by Neurotar Ltd, Helsinki, Finland. A presentation with more detailed information on the study can be found here. Two-photon microscopy is a new imaging technique which allows a 3-dimensional visualization of subcellular structures in vivo to a depth of about 250 µm with a resolution of less than 1 µm (‘non-invasive optical biopsy’). Both products were applied twice daily to the left and right forearm, respectively, of volunteers during 4 weeks. After 7, 14, 28 and 60 days (i.e. 32 days after the last product application) image stacks were obtained from both forearms. All imaging parameters were kept identical between imaging sessions and the same skin spot was targeted each time. Statistical analysis was performed using Student’s paired t-test. The forearm skin of aged human volunteers was analyzed longitudinally. Autofluorescence and second harmonic generation (SHG) image stacks were collected in two separate channels. Stacks are series of images obtained at increasing depths from 0 to about 210 µm. They can be considered as vertical scans of skin. Prior to the application of test products, baseline image stacks were obtained on Day 0. Pictures were obtained at a depth of 80 µm (dermis). 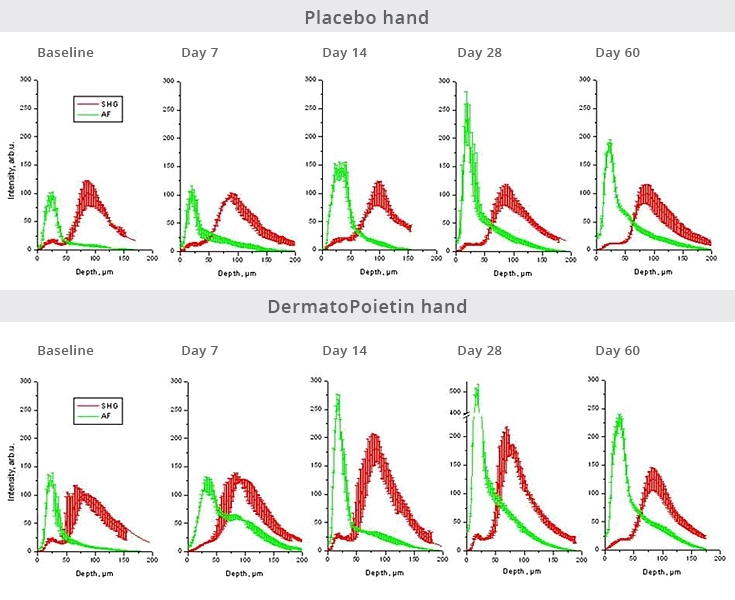 They show a strong increase of collagen (red) and elastin (green) after application of Dermatopoietin compared to placebo and to baseline. Pictures were obtained from the same skin spot. 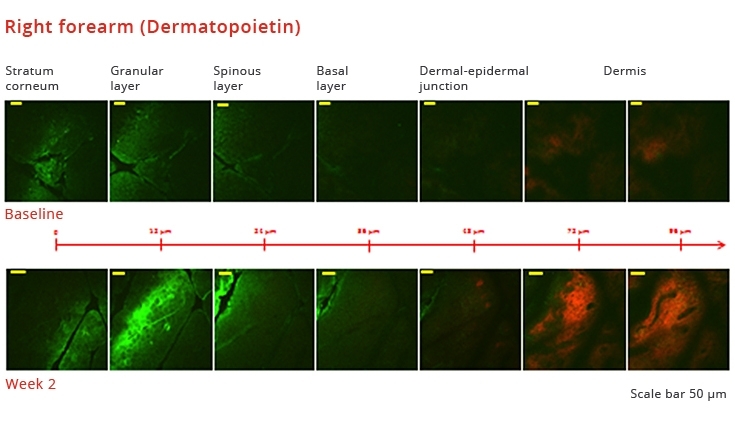 Clearly visible is the increase of collagen (red) in the dermis after 2-week use of Dermatopoietin® compared to Baseline. The reason for the increase of green autofluorescence in the granular and adjacent layers of the epidermis is not known. Epidermis: 0 – 50 µm. The green autofluorescence curve reflects keratin and flavoproteins. Dermis: 50 – 200 µm. The red curve reflects collagen, the green reflects elastin. The reason for the increase of the autofluorescence signal in the epidermis upon treatment (placebo and verum) is not known. Only treatment with Dermatopoietin® leads to a strong increase (almost a doubling of the area under the curve) of elastin and collagen in the dermis after 2 - 4 weeks. On Day 60, 32 days after discontinuation of treatment, the collagen content is back to about 20% above baseline.